Gifts from the Pirates: "And on that day Mr. Caper learned how sweet being earthy and acidic could be." "And on that day Mr. Caper learned how sweet being earthy and acidic could be." With tomorrow being World book day you would expect every school around the world to be doing something amazing to join in with the celebrations. Not Seth's school though, for the past 3 years they have not done anything and the couple of years before that they decided to have their world book day on a different day??? I have absolutely no idea what is going on in the head teachers mind but clearly there is something wrong up there. When we asked his teacher why they didn't do anything he simply said "we're not allowed". So again this year March 2nd has come around and Seth, much like many children at his school I imagine, is left disappointed. 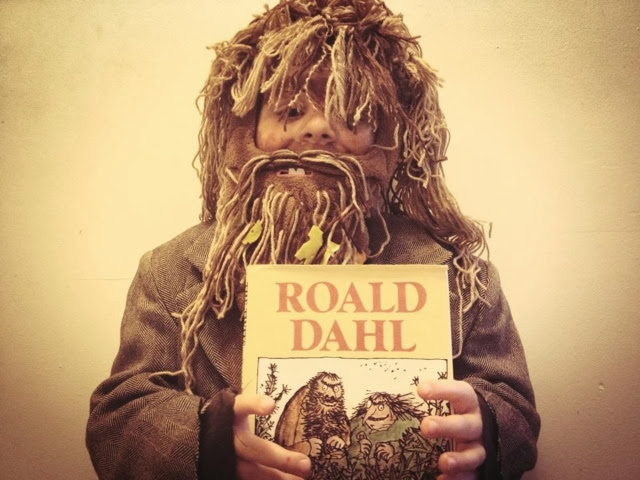 He loved the costume we made him a few years back and proudly walked across the playground dressed as Mr Twit. What has annoyed me even more though is that this failure to get involved with the whole world on this awesome day has left Seth unmotivated to get involved in what we are doing too, which is really sad. Opeie and I have been crafting away this week though and decided to have a World Book Day activity week in preparation for the big day, so we've been busy doing all sorts. Opeie wanted to make masks of some of his favourite book characters. So he made the Lorax for Mrs M, the sweet lollipop and sour caper from The great Lollipop Caper by dan Krall, for me and him and for Seth, Bzzd from the DC Super pets from the books that Opeie is reading at the moment. Opeie also wanted to make a giant crayon from Oliver Jeffers amazing book 'The Day the crayons Quit'. If you've not read this book already it's a must. While chatting to Mrs M in the kitchen a couple of nights back I asked if she had any fun ideas for something we could do to add to our activities and she said we should take some chocolates and biscuits down to the staff at our local library, which I thought was a great idea. We picked up some bits while we were out shopping and then we made some book related packaging to go around each thing. It's been lovely seeing Opeie get into all this book-related fun. Opeie finished off his fun world book day treats with a card for the staff at the library and he's looking forward to dropping them off tomorrow. We also gave his scooter a mini makeover too for the celebrations but I'll put that in a separate post. It's going to be another fun couple of book themed days for us and We hope you all have an amazing world book day too.